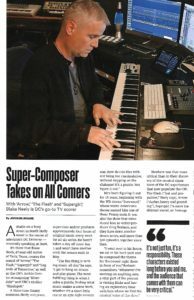 For the main story in this week’s Music for Screens section in Variety, I profiled Blake Neely, who composes, supervises and/or produces approximately four hours of music every week for such DC Comics shows as Arrow, The Flash and Supergirl; the Archie Comics revamp Riverdale; and the thriller Blindspot. He’s also got a documentary coming up and will shortly score the second feature by his frequent collaborator, producer-director Greg Berlanti. (I even got him to talk about his theme for CNN’s The Sixties / Seventies / Eighties.) It was great fun visiting him at his ultra-modern North Hollywood studio and seeing how he works with his team. This entry was posted in Composers, Film Music, Interviews, Television Music and tagged Arrow, Blake Neely, Blindspot, CNN The Sixties, comic-book hero music, DC Comics TV shows, Legends of Tomorrow, Riverdale, Supergirl, superhero music, The Flash, Variety on April 13, 2017 by Jon Burlingame.